Our house is well set up. Fully equipped kitchen with dishwasher, fridge, oven, cooktop stove and microwave. Internal laundry with top loading washing machine and dryer. Wood burner, heat pump and double glazed windows. Two bedrooms and one bathroom are located upstairs. The master bedroom has a private balcony and ensuite access to the shared bathroom. The second bedroom has twin beds. All rooms have a heater and electric blankets on all beds. On the main floor are the kitchen, dining and living area, one double bedroom, bathroom and laundry. From the laundry you can access a covered outdoor courtyard. The double garage has a remote controlled door with internal access to stairs leading to the main floor. The driveway is quite steep and not suitable for minivans but there is ample room to access the garage. OK if you want to bring your pets, but we have a few rules. We ask that you leave the home neat and tidy as you find it. Comfortable stay , with amazing view , great home , central and perfect for entertaining an overseas visitor . Would be happy to return . We appreciate the review and thank you for being such wonderful guests. Loved staying in this place with our adult family of five. The house was spotless, great views from the balconies , close to town and the place had everything we needed. We will definitely be coming back her to stay again next time. Happy our home was perfect for your time in Queenstown, thank you for being such great guests. Recently we stayed a few days in this lovely property during our daughter's wedding, the property was very clean and the view from the property was just magnificent, the property was so well equipped you would find everything you may need, the instruction for access to the property was also very clear which makes arrival so much easier. 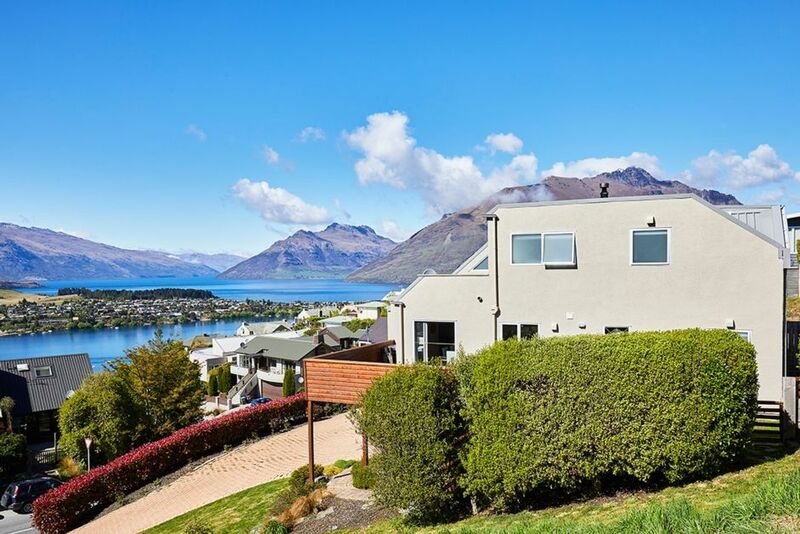 We would be happy to book the property again for our future trips to Queenstown. Highly recommended. The place was perfect. Very clean, wonderful views and good location. It was just what we needed. Marcia and Cheli are very welcoming and helpful. Very good communication. Thanks for the great feedback and we are glad to hear you enjoyed your stay! This was a great base for a wonderful week exploring Queenstown and its surroundings. With the owner's instructions we successfully navigated the steep driveway in our 4 wheel rental. The house has fantastic views, was clean and well appointed. We were two couples and we were lucky enough to have the beautiful master bedroom and en suite upstairs. The other couple weren't so lucky as the double bed downstairs wasn't comfortable and one of them ended up in a single bed upstairs. A family staying there might find the configuration works better, but an additional queen bed would be great. The only other thing we didn't enjoy were the extremely squeaky floorboards in the master bedroom. Impossible to creep out to the bathroom without waking your partner! Tricia I am sorry that your stay in our home did not meet your expectations. Before accepting any booking we always make sure guests are aware that it is only a double bed in the room downstairs due to the size of the room. Thank you for the feedback in regards to the floor which is chipboard. Unfortunately we will only be able to look into that when the carpet is replaced. I hope that despite these inconveniences you enjoyed Queenstown.